These templates contain information and visual guidelines to ensure you design your artwork files correctly with respect to our printing process and requirements. 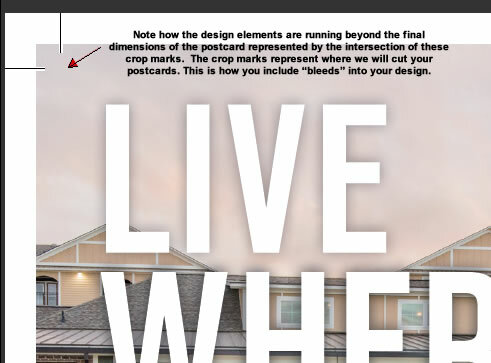 Bleeds / Crop Marks - Make sure you following our design template guideines. Here is an example of bleeds and crop marks properly included in a postcard design file. Example of Bleeds Included in Your Postcard Design. Bleeds allow us to correctly cut down your postcards to the desired size and without compromising the intended look of your design. If you do not run those design elements beyond the final size (as shown in the example), then your mail piece will not end up as you intended. If we have to fix this issue (as opposed to you fixing it and resending the artwork), then there will be additional charges to your project. Sometimes, however we cannot fix the issue unless we have all of your original design elements...in which case we are essentially redesigning your postcard, and there will be additional charges for this as well. So, do not forget to incorporate this into your design files BEFORE you send them to us! Color Mode - We prefer the color mode to be CMYK in your design files submitted to us. Please consult with your design software for details on how to save your files in CMYK color mode. Further, we also recommend the GRACol2006_Coated1v2.icc color profile in your design softtware for optimal results. File Size - You can send us any file size...however your email provider may not allow larger file sizes (e.g. 10 MB and up). If you need to upload a larger file, you can either use 3rd party transfer services such as Dropbox and share the link with us, or you can use our upload feature in our print store. Image Resolution - This is extremely important. All pictures / images used in your design must be at least 300 dpi. 350 dpi is preferred. If you are taking images off of the internet, there are 2 problems associated with this. First, the images are usually copyrighted. Second, the images are usually low resolution and will show up grainy/pixelated when printed. If you have any questions about these design templates or guidelines, just hit chat and ask. Don't Feel Like Designing on Your Own? Skip Everything Above and Let Us Handle The Design For You!